Upper: The KS-47 G2 upper receiver is precision machined out of forged 7075 T6 aluminum, and then hard coat anodized for durability. While retaining the look of a standard M4 upper, the KS-47 G2 upper is designed to work with the new Gen2 KS-47 lower. The upper features integrated over-insertion tabs to prevent the bolt from dragging on the magazine. This CMV 4150 barrel is chambered in 7.62x39 with a 1 in 10 twist and has a single, large feed ramp to accommodate the larger case diameter of the 7.62x39 round. The barrel is nitride treated for accuracy and durability and is finished off with a 5/8-24 thread A2-style compensator. The forward assist, dust cover, charging handle, and safety are all standard AR-15. This KS-47 G2 upper is finished off with a PSA 15" Lightweight M-Lok Free Float Rail. The KS-47 G2 upper will not work with a standard AR-15 lower. Can I convert the gas system to piston driven? I could make this a featureless rife and be ca compliant, but how do I get it here first? BEST ANSWER: Your best bet would be to purchase a stripped KS-47 lower if PSA will offer one, then purchase the upper separately, which I believe the upper is not regulated in CA, that way you could customize the lower to be compliant with CA's ridiculous laws and regulations. The solution is simple. Stop voting in liberal piles of loose stool. What stock and trigger come with this gun? Will this use ambidextrous saftey???? Can you use 7.62x51 NATO rounds with this AR? Are ten round mags available for this? BEST ANSWER: Yes , Standard AK mags 10, magpul, please read , description of magazines that work and check if available. Drums work in this also. I got this as a birthday present and it is amazing. I have had no problems with the gun. It is very accurate even for the 7.62x39 round. I am left handed and absolutely love the magazine release. The only thing I would recommend when buying this is getting a new charging handle since it is a heavy buffer spring and lots and lots of ammo l. You'll burn through it having so much fun. Also if you would like to shoot this but can't shoot most 7.62x39 brands of ammo at your local range. I recommend the ppu brand it's cheap, reloadable, and accurate. Great Rifle worth every dollar!!! 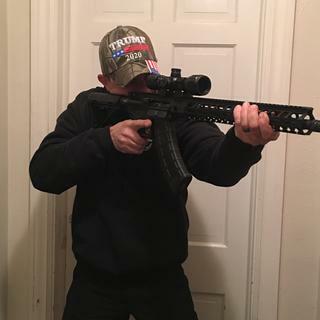 This is the 1st "Hybrid" rifle i have owned, being an AR platform and shooting 7.62X39 while taking standard AK47 mags. I was at 1st skeptical about this firearm especially after some of the video i saw mainly with the 1st gen KS47. However after pushing aside these reservation and buying this firearm i must say that i am beyond pleased with it. Everything about it screams quality and i can not/ have not found anything cheap or spotty about its quality. I took it straight out the box and put 60 rounds out of it with no issues to report with the exception of the use of a X-Tech Tactical Mag47 magazine. These mags are not on the list of functioning mag with this platform, however these are higher end mags for the AK platform. As such i was interested in seeing how they would preform in this platform. While it did feed the rounds perfectly the design of this particular mag is just a little to big in almost all dimensions. especially the locking lug, which cause the mag to rock out due to the inability to properly lock in place with the KS47's mag release lever. the constant shock and vibration of the gun being fired was to much for this mag to stay in, however i do not fault the KS47 for this but rather the fatter design of the X-Tactical Mag47 magazine. when using a variety of Pmags, size capacities and generations, i had zero issues with the performance of this firearm. It is an excellent rifle worth every dollar. If i had to give it a ding it would be that at least in my experience, it not having any lube on the BCG or bolt, however this did not impact the performance of the rifle it shot flawlessly. 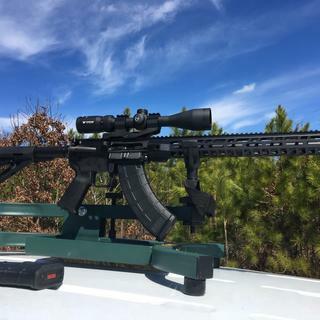 in short i would say if you are on the fence about this rifle do yourself a favor and get it, especially while it is in stock, you will not be disappointed. Tell you right now hands down great rifle. Shot mine for the first time last night out of the box and had absolutely no malfunctions. Great rifle for the money. Gonna buy another in the future. Received my PSA KS 47 with 15" hand guard last week. It looked great and appeared to be very well built. I inspected it, cleaned it up and then mounted a vortex scope on it and took it out shooting. I'm not sure if the trigger group pin is supposed to be staked but it is not on my gun. I fired another 75 rounds through it after the field expedient repair without any more problems. I shot Wolf Poly performance FMJ, Golden Tiger FMJ and some Berdan Hollow points for a total of 165 rounds fired without any issues cycling or firing that ammunition. I shot the gun at 110 yards at my steel targets and it was an absolute pleasure to shoot. I've cleaned it up after shooting and everything looks good inside. Not sure what I'm going to do about the trigger pin for now other then keep and eye on it to make sure it doesn't walk out again and keep putting rounds through it. I shoot a lot so only time will tell. Over all I'm pleased with my first purchase from PSA. First 165 rounds down range. It's a shooter! This one has the Pic rail over the top of the entire handguard, unlike the other 16" barrel version, but didn't realize it until I received it. It's really just cosmetic, other than a minuscule weight reduction, so I can't complain. I attached a Burris 3x and zeroed in about 3 or 4 shots, and then it was off to the races. 250 rounds in, with no malfunctions to speak of. I was just going for volume more than accuracy, but it was doing solid groups at 50 yards. The only thing that could be viewed as a negative is that there is no bold hold open feature with the bone stock gun, so if your range wants to see an open bolt, you'll need to put an empty case perpendicular to the ejection port to demonstrate that. That's what my range told me to do, in any case. I know they have AK mags that will create a last round bold hold open effect, but don't know if they'll work with this KS-47, if you really wanted to look into that.